It seems we were pretty lucky last night. We lost power at 12:15AM, and some major branches fell on and around the house, trashing the TV antenna. But, I also heard, among the earthquake-like shaking of the house, a loud creak, but no thud. I figured a tree fell, but didn't hit anything, and maybe it wasn't that close. In the morning, I wasn't sure whether to bother walking the deck to see whether it had been hit, but I did. 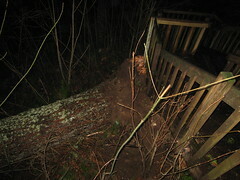 Amazingly, the deck wasn't damaged (at least not much), but this 4-5-foot wide tree that was uprooted, just next to deck, to the left of the second or third flight of stairs from the south entrance. The tree feel southward, along the slope below the parking spaces.